I’ve started a City and Guilds course – specifically, a Certificate in Design and Craft, with a focus on patchwork and quilting – and recently we had our first weekend class. The course should take around two years in total. One of my personal aims is to codify and make explicit what I’m learning, so you can expect somewhat regular updates as we go along. Spending a weekend immersed in colour was … oh, goodness, it was wonderful. Does colour electrify you the way it does me? Does a good hit of colour leave you rocking and a-reeling? Does the right combination of this and that feel like the quenching of a deep thirst? I found my physical response stronger than I would have guessed, actually. We were half way through the first morning when I happened to pause and take stock of my body. I was … how shall I put this delicately? … exhibiting classic symptoms of arousal. Ahem. Apparently, playing intensively with colour is a good way to activate the pleasure centres of the Léan. Note to self. A monster called “This Really Is Too Easy” (aka TRITE) showed up too. 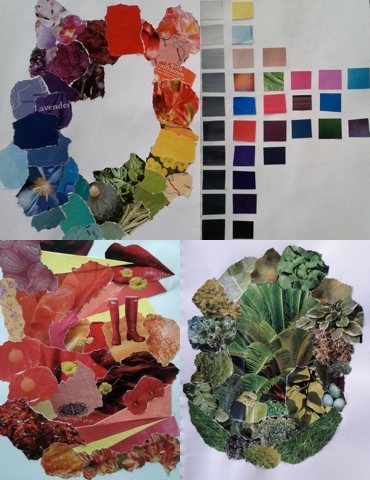 The tasks we had to complete in class were all relatively simple – painting gradients, making colour-wheel and colour-scheme collages, that sort of thing. This I found vaguely irritating, because I always want to be making Splendid!Things! and stretching my capacities and working at multiple conceptual and aesthetic levels and … well, let’s be honest, a colour-wheel collage doesn’t really do that. Nothing I produced in this class particularly scratched my I made a Splendid!Thing! itch. Nor did my finished pages in any way do justice to the blaze of enthusiasm I was feeling throughout the class. TRITE wasn’t too happy with this. Where, he wanted to know, were the whizz and the bang? When was I going to start making something impressive? TRITE thinks that any time not spent actively seeking to impress is a waste. And probably dangerous. Because if once we let our standards slip, where will it end? Perdition! Annihilation! Doom! That’s where. And yet, as I was eventually able to reassure him, the simplicity was also soothing. Because these are – yes, it’s obvious to everyone except poor old TRITE – exercises. I’ll say that again: exercises. They’re not meant to be works of art. They’re not meant to push the boundaries of creative expression. They’re meant to enable us to move methodically through the space we’re exploring, laying down breadcrumb trails, hammering in surveying stakes, clearing undergrowth and marking out foundations. They are – we hope – the underpinnings of a new understanding that will inform and enrich our work. Which is why I’m doing the course in the first place. Whee! The theme of the second weekend class is line, and, unfortunately I’ll be missing it on account of my trip to Portland for Rally. I’ll have some catching up to do after I get back! Where do you stand on colour? I’m not asking for intimate revelations here (though, you know, feel free…) – but I’d be fascinated to hear how you experience the colours you love most. It makes my toes fizz, since you ask. Colour! I loves it! Yes, enough for consecutive exclamation points! My best friend and I have been known to get slightly worried looks from other customers in Paperchase as we fondle the coloured paper. My favourite colours just seem to set me vibrating happily. Mmmm…. @Maria: Red is *brilliant*, isn’t it? 🙂 My kids love it too, particularly the Feaster. @Jane: I love how different substances take colour differently – e.g. silk, wool, cotton, paper… There’s so much richness. So much subtlety. YUM! Not a particular colour, but a particular quality of colours – bright, clear colours. Washed-out greyish-green, dull beigeness, ‘filters’ that make photos look wrong and blunt their colours, that makes me sad. Just about to complete a colour resolved piece for a similar C&G course. Agree with Ruthi about all Clear Bright Colours. Agree also with Lean that the importance of the exercises is the leaning of basics. We are never alone!